If you decide to invest in a Foosball table, you need to know how to get the best quality for your money whether you’re buying in person or over the Internet. There are a number of tips that can help you narrow down the selection and choose the Foosball table that will best serve your needs. It is not a good idea to just go to a store, see a table you like, and take it home. You’re much more likely to buy a disappointing table in that situation. Learn a few tips on what makes a good Foosball table before shopping, and you’ll maximize the fun you have playing Foosball. Perhaps the most important question to ask of yourself (and your roommates if you have them) is exactly who will be playing Foosball? Do they have any strong preferences? Are they casual players who like to have fun playing Foosball while unwinding with a beer? Or are they serious competitors? Ask yourself the same questions. The needs and wants of those who will be using the Foosball table most are vital to making a good choice when it’s time to buy. You also need to assess the need for safety. If children will be using the Foosball table a lot, safety should be an overriding consideration. Some tables have the usual solid rods that go through both sides of the tables, and some use telescopic rods. Telescopic rods are generally considered safer because they only go through one side wall of the table, rather than both sides, like the traditional rods do. How the play of the game feels is very important, too. If the rods are hard to turn, or too heavy, then players’ arms can get tired, and eventually you’ll probably stop playing altogether. Maneuverability is governed by a number of factors, such as: the gap between the “feet” of the figures and the table; the shape of the feet; heaviness of the rods; the markers on the play field; the “grippiness” of the handles; overlap of coverage by the playing figures; the composition of the ball; and the field surface. The ease of use of the Foosball table is also vital. If it’s a pain to use, then nobody will want to play. 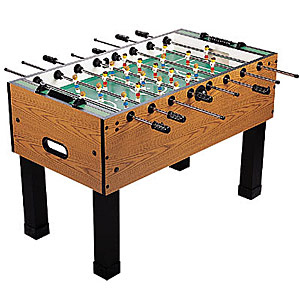 The user-friendliness of a Foosball table has to do with factors such as whether the figures’ weights are balanced, and whether they are easy enough to move horizontally. Sturdiness and durability of all the parts are also important. If you’re always worried you’re going to break part of the table, then it’s not going to be much fun to play. Of course, budget is an issue for almost everyone. You want the best value for your money. There’s really no way to beat shopping around, whether it is in person or over the Internet. Brands are not as important as quality and suitability. The brand that works at your brother-in-law’s apartment may not work where you live. If you think you might be selling your Foosball table after a couple of years’ worth of enjoyment, then you should choose a model that retains its resale value well. One way to assess this is to search auction websites and see which brands and models do well in the resale market. And finally, but no less importantly, aesthetics should be at least somewhat important, particularly in a shared housing situation. Make sure that the people you live with are going to be able to stand to look at a Foosball table of the size and look that you plan to buy. Compromise may be necessary, so be prepared.